If Manchester City or Liverpool approach fixtures at Brighton with the tactical set-up and collective body language Manchester United did, I will be stunned. After a defeat in which Paul Pogba said United lacked “hunger”, I am keen not to overreact but some fans will be raging as their side looked like they did not really want to compete. The tactical plan comes from the manager and, putting the result aside, my big concern now is if United’s players are still on board with what he is asking them to do. Only once in my career did I have a manager where eventually players were at odds with his style. Lawrie Sanchez wanted a direct, combative approach at Fulham but it became nearly impossible as we didn’t have the personnel to fit the task. Eventually, we had a run of bad results and players lost belief in the demands. It is not a conscious thing. Players are not sat in the dressing room stating they will not follow the orders, it happens subconsciously and if that creeps in with just a couple of players then the collective performance will inevitably suffer. Despite all their quality, United were not on the front foot early on and did not really press Brighton high up the pitch at all. The impact is that home players get early touches, grow in confidence and begin to realise they have space so settle down. Then United fell behind and it is hard to change the mentality to suddenly chase a game. We expect to see one of the big sides in the league have at least one 20-minute spell where they stretch and force the lower-ranked outfit to cling on but it never came, there was simply no real urgency from minute one and it gave Brighton a platform they should not have been afforded. Mourinho’s cautious approach would be fine if you have players who like to defend and sit in but if your personnel are collectively more expressive, they will find it harder to excel. Forget the result, as anyone can lose on the road in the Premier League, it is the nature of the body language and that lack of early conviction which is a bigger concern and fans will want a reaction because at the Amex – against a side who lost last week – their players just did not look engaged. Manchester City’s three central defenders on average played 76% of their passes in the opposition half in their 6-1 win over Huddersfield. In contrast, with Manchester United not pushing as high up the pitch, Victor Lindelof and Eric Bailly played 19% of their passes in the opposition half. We watched Pep Guardiola’s Manchester City side go for Huddersfield from the off in their 6-1 win on Sunday. City and Jurgen Klopp’s Liverpool will undoubtedly go to Brighton and test them by pressing immediately. It is a mindset of positivity in contrast to what United delivered, with one shot on target in the opening 45 minutes. 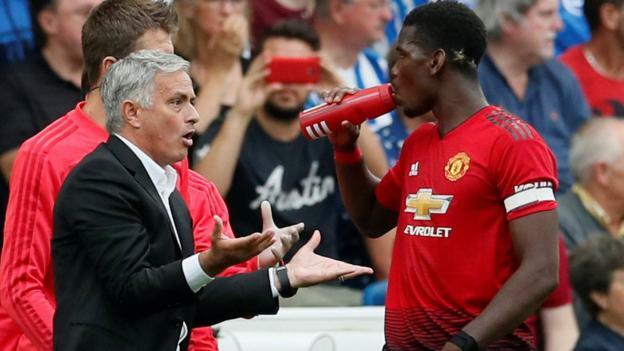 Mourinho has fuelled paper talk with comments about a disrupted pre-season, transfer frustrations, or even the form of Pogba, who was one player trying to do something on the south coast. All the big teams have got these problems. Take Tottenham as an example, they have loads of players who were at the World Cup until late, as did Manchester City. If you look at Spurs boss Mauricio Pochettino, he’s not moaning about not getting any players in, he’s even pacifying fans over new stadium problems – not whinging – and working with his players he has two wins from two. Manchester United (left) made five successful tackles in the entire match with none of them arriving in the opening 45 minutes. Brighton’s pressing of the ball saw them win 13 tackles during the match with eight of them in the Manchester United half. Mourinho, as we know, is a far more successful manager and a winner so I am not questioning him but sometimes it is better to not make excuses and just get on with it. He may well be saying one thing to the press and then telling his players his motive for saying it, but that would be rare. And, to be honest, if his players are hearing the messages in the media then I do think it can create a bit of negativity. It’s hard to judge the mood of a group of players based on reports but you would have to concede that there’s often not much smoke without fire and too many players looked off it at Brighton. The combined touch map of Fred and Andreas Pereira shows both men struggled to make any impact in the final third. The graphic shows United’s play from left to right with only Pereira’s touch for a corner kick registering in the final third. Pereira was taken off at half-time while Fred played the full 90 minutes. Only 11 of Pereira’s 35 passes were made in the Brighton half. Dale Stephens ran further than any other player on the pitch on Sunday and saw more of the ball than any other Brighton player in his central-midfield role. There were times when he had 20 yards of space despite United using a midfield three of Pogba, Andreas Pereira and Fred. From Mourinho’s perspective, that should not be happening when you ultimately have better players. His midfield struggled as a trio and generally their displays were a bit safe and their positioning too predictable. None of them wanted to make positive runs in behind Brighton’s back four, with Pereira and Fred both particularly negative. Mourinho changed it at half-time and recognised the issue, as good managers do. His side were crying out for Jesse Lingard, who likes to run in behind. When you’re on the ball in midfield, if you have someone making those kind of runs it is so helpful. Juan Mata and Anthony Martial in wide areas did not threaten the space behind Brighton, and even though there may not have been much of it at times, Lingard is so clever that he is great at mixing his game up and will drop into pockets to get on the ball if needed. I’m not sure you need Pogba, Fred and Pereira in the same midfield, so there is a balance which will need to be found, and at the back there are some questions to be answered too as the central defenders were a problem. Eric Bailly and Victor Lindelof were given a tough afternoon by Glenn Murray, who was absolutely superb. Mourinho verbalised his desire to sign another central defender and there were links with Leicester’s Harry Maguire but somehow he needs to get more from those he has for now. It is key to point out that Brighton were collectively and individually superb and when you get both of those together you are in a fine position. The decision-making was bang on, there was a lack of sloppiness and they made the most of their chances. Everything about them was well drilled and solid, a complete contrast to the visitors. I can understand some United fans may be wound up and concerns may be deepening but when you step back, Mourinho has options aplenty to change things. Ander Herrera could come in and give some steel, Marouane Fellaini could start and of course Alexis Sanchez can return. Those kind of introductions can quickly see a club like United rattle off four or five wins and the mood changes. Pogba admitted they were found wanting on Sunday so there needs to now be a reaction against Tottenham next time out. It will be a real test but is a game which may suit United given Spurs have an awful record at Old Trafford. Much will be said about Mourinho in the week leading up to that outing but I’d be loathed to have big concerns over them in terms of a potentially disastrous season. The ease with which they went down at Brighton was not good but if they are engaged properly and their body language is righted, United will start getting the most out of a quality squad.